A lot of those features are modular and may be enabled for each user by choosing which Xlets they can see. 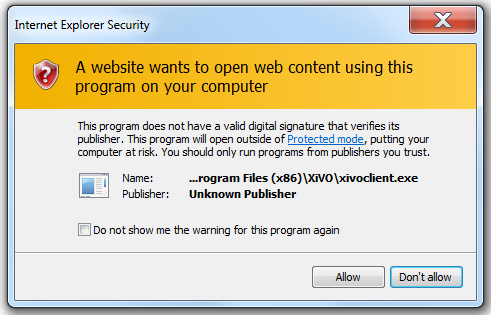 The installed version of the XiVO Client must match the XiVO server’s version installation. With our current architecture, there is no way to guarantee that the XiVO server will be retro-compatible with older versions of the XiVO Client. Non-matching XiVO server and XiVO Clients versions might lead to unexpected behaviour. For Mac OS, double-click on the file and drag-and-drop the inner file on the Application entry of the Finder. The XiVO Client should then be available in the applications menu of each platform. If you want to build your own XiVO Client, see Building the XiVO Client. 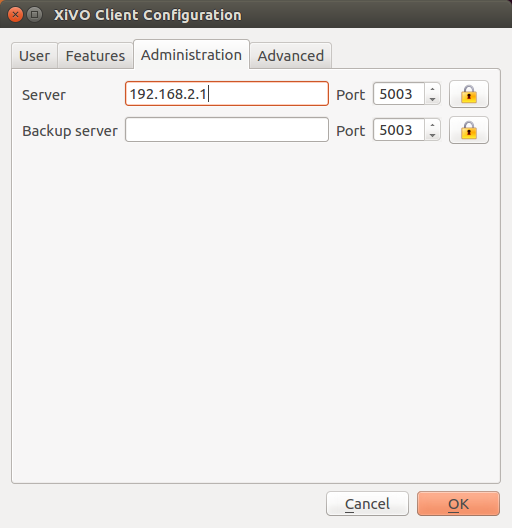 To connect to the server using the XiVO client you need a user name, a password and the server’s address. Optionally, it is possible to login an agent while connecting to the server. Xlets are features of the XiVO Client. It is the contraction of XiVO applets. To select which xlets are displayed in your client, see CTI profiles. The XiVO Client configuration options can be accessed under XiVO Client ‣ Configure. This page allows the user to set his network information to connect to the xivo-ctid server. Server is the IP address of the server. Backup server is the IP address of the backup server. To use STARTTLS, the server needs to be configured to accept encrypted connection. The XiVO Client can handle telephone number links that appear in web pages. The client will automatically dial the number when you click on a link. You must already be logged in for automatic dialing to work, otherwise the client will simply start up and wait for you to log in. The option in the XiVO Client GUI Options ‣ Allow multiple instances of XiVO Client must be disabled, else you will launch one new XiVO Client with every click. callto: links will work out-of-the-box in Safari and other web browsers after installing the client. tel: links will open FaceTime after installing the client. 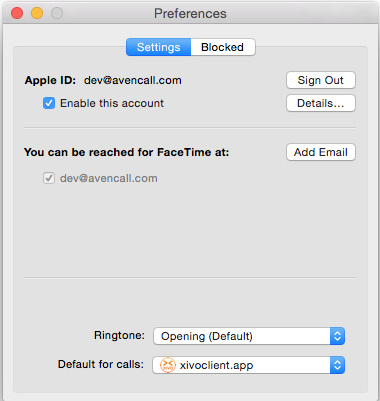 To make the XiVO Client the default application to open tel: URLs in Safari. The tel: URL works out-of-the-box in versions of mac osx before 10.10. 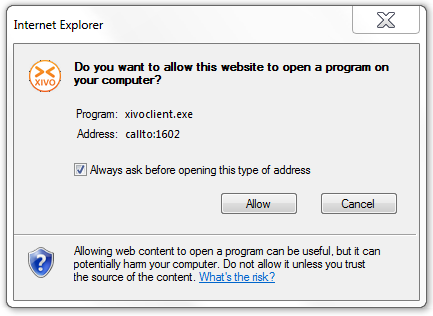 XiVO Client is associated with callto: and tel: upon installation. Installing other applications afterward could end up overriding these associations. Starting with Windows Vista, it is possible to configure these associations via the Default Programs. 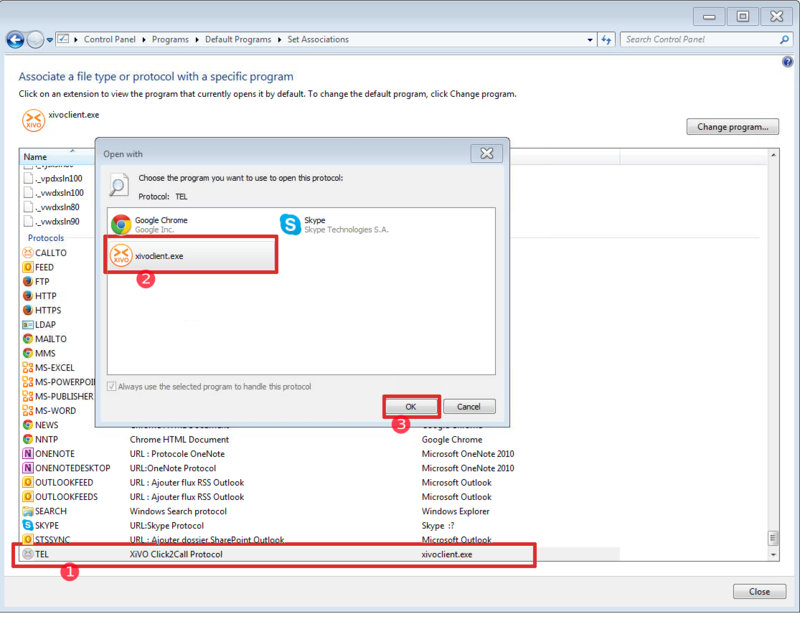 Users can access Default Programs from Control Panel or directly from the Start menu. 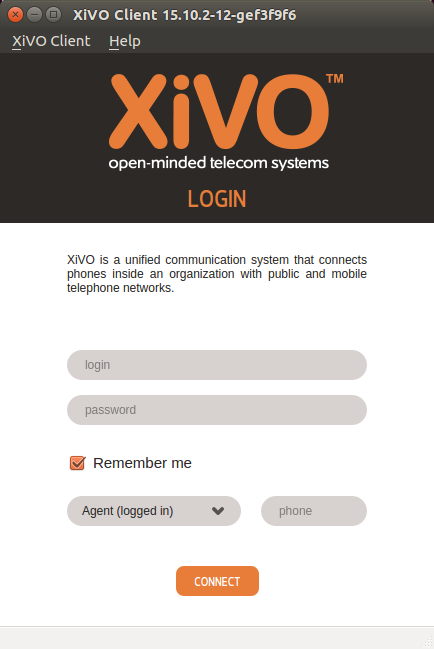 Simply click on allow to dial the number using the XiVO Client. If you do not want these warnings to appear each time, do not forget to check/uncheck the checkbox at the bottom of the popups. Currently, callto: or tel: links are only supported in Firefox. There is no configuration needed. Currently, callto: or tel: links are only supported in Firefox. If the XiVO Client is not listed in the proposition when you open the link, browse your files to find /usr/bin/xivoclient. The next time that you click on a telephone link, Firefox will ask you to choose an application. You will then be able to choose the XiVO client for handling telephone numbers.